Epilepsy is brain disorder caused by abnormal brain activity. Epilepsy is brain disorder in which patients have seizures, caused by abnormal brain activity. Traditionally, people think of a seizure as complete body shaking with unconsciousness. This is a type of seizure called a generalized tonic-clonic, or grand mal, seizure. There are other types of seizures though too. Simple partial seizures can just involve an abnormal taste, abnormal smell, focal hand shaking or abnormal sensation. Absence seizures may involve being awake, but somewhat unaware of one’s surroundings or “daydreaming”. Some patients have seizures infrequently. Some patients have 20-30 seizures a day. Some patients have a warning sign before the seizure, often called an aura. This can be an abnormal feeling in their stomach, fearful emotion, metallic taste, flashes of light, or abnormal smell. An aura may be a simple partial seizure itself. Some patients have various changes following a seizure, which is often called the “postictal” period. The initial treatment of seizures is medications. There are many antiepileptic medications, and many people control their seizures on them. In a famous 2000 study published in the New England Journal of Medicine, nearly 50% of patients can be seizure-free with a single medication. This indicates that monotherapy response is a good prognostic factor. However, certain patients still have seizures despite many medications. A patient is often considered to have “refractory epilepsy” if they fail 2-3 single medications and one attempt at taking multiple medications. Refractory epilepsy usually takes about 9 years to develop. 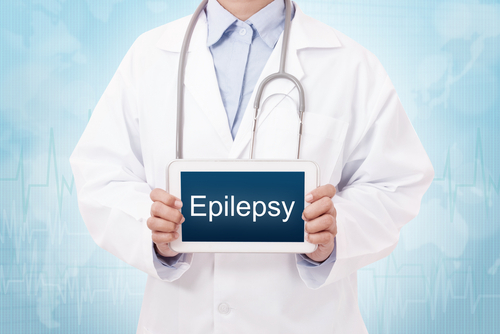 When a patient has refractory epilepsy, they may be considered for seizure surgery. 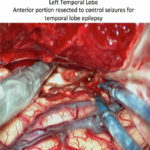 The type of seizure surgery depends on numerous factors. Some patients develop epilepsy because they have a tumor, birth defect, or collection of abnormal blood vessels in the brain. 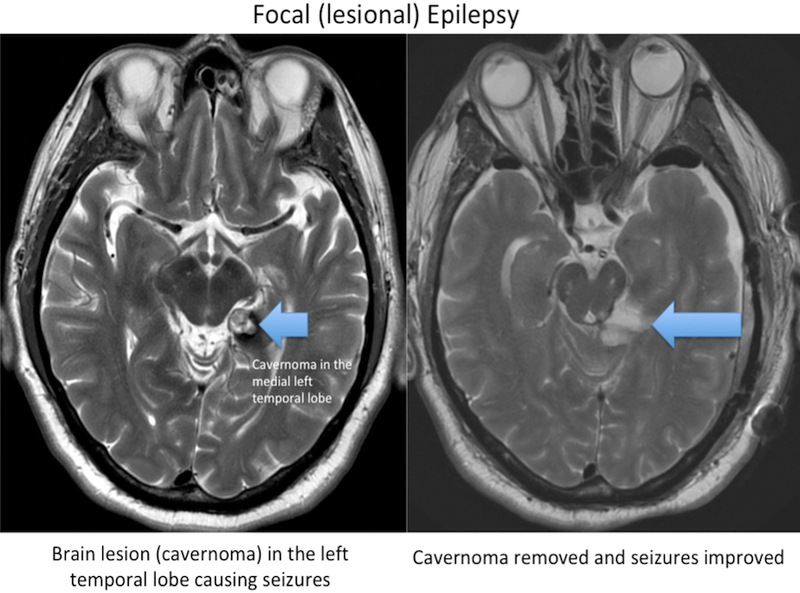 This is lesional epilepsy, because some sort of lesion is causing seizures. 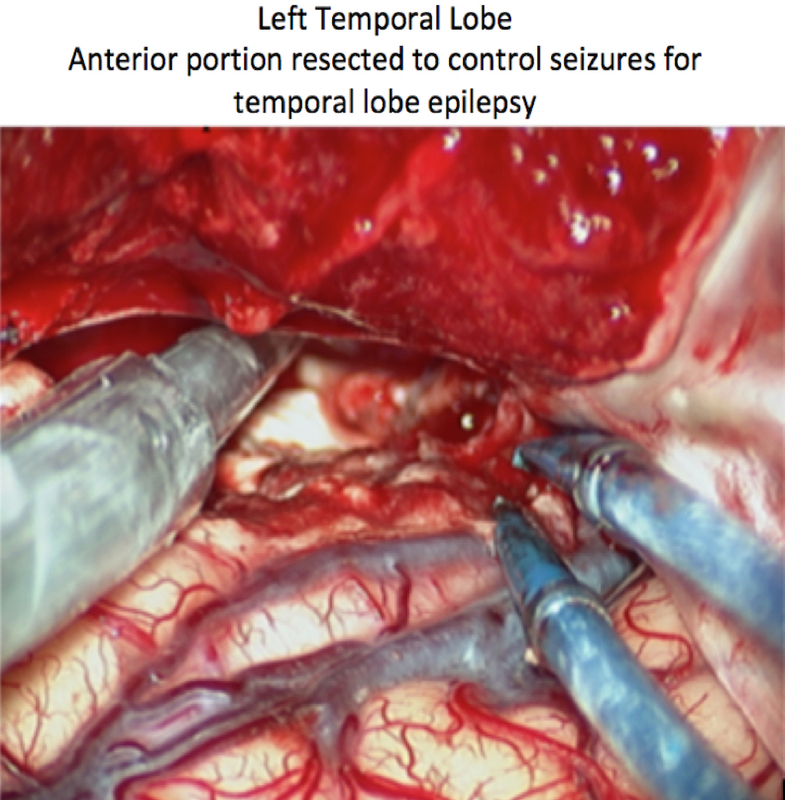 In these cases, surgery may be able to remove the causative factor and improve the seizures. 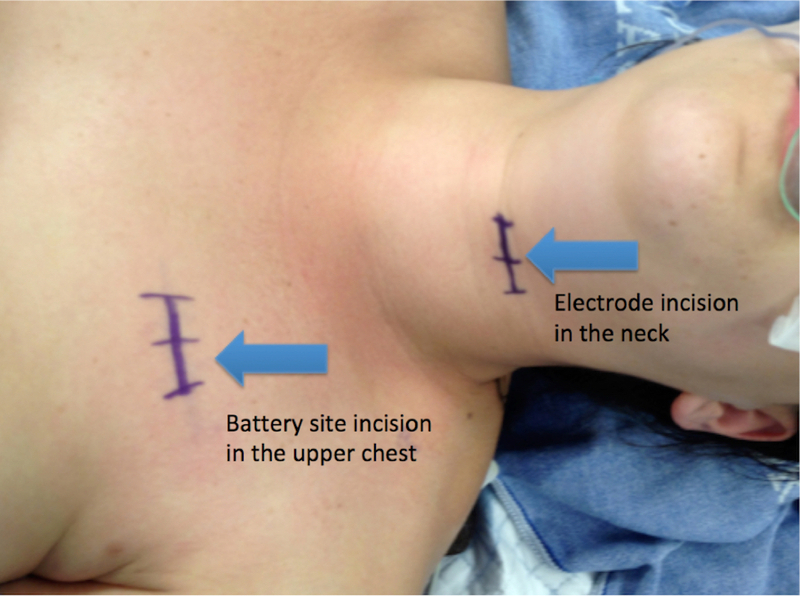 It is important to remember that surgery cannot guarantee seizure freedom even in this scenario. Other people have an abnormality in the temporal lobe of their brain. This may require removing a portion of the temporal lobe. 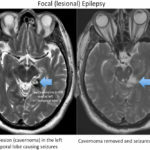 Unfortunately, some patients do not have a specific focus (“non-focal epilepsy”) and many different areas of their brain are causing the seizures. This can be a difficult thing to treat. Vagal nerve stimulation (VNS) is a type of seizure surgery used to treat non-focal epilepsy. The main indication is “medically intractable complex partial epilepsy”. It was previously noticed that some patients could stick their head in ice water to stop a seizure. While this was a primitive solution, it gave insight to the idea that vagus nerve stimulation could stop a seizure. 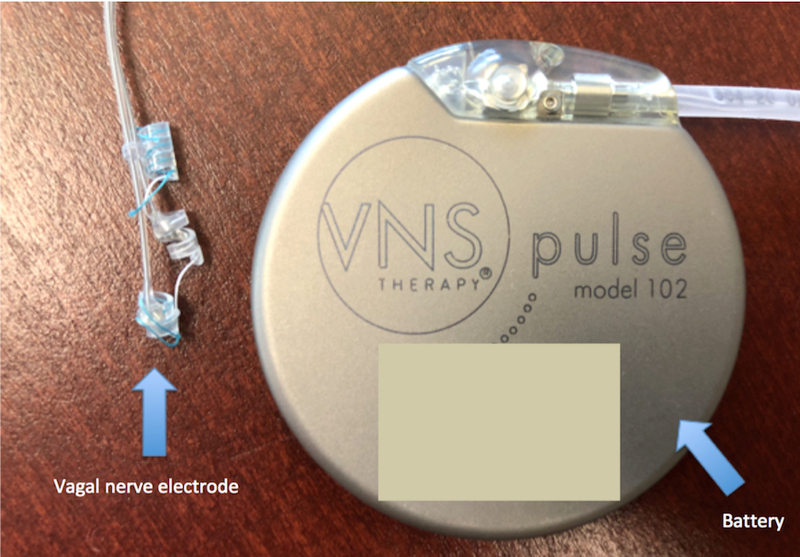 Vagal nerve stimulation involves placing an electrode on the vagus nerve, which is connected to a battery in the upper chest. It is thought that stimulation of the vagus nerve sends signals to the thalamus, which can stop the seizures. The left vagus nerve is used to avoid extra side effects of the surgery. 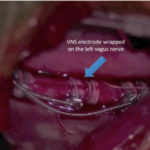 A small incision is made in the left neck, and the VNS device is carefully wrapped on the vagus nerve. 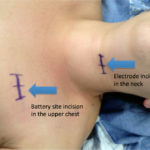 The electrode is then passed under the skin to the upper chest where a battery pack is placed. The battery does require future surgery to replace the battery. 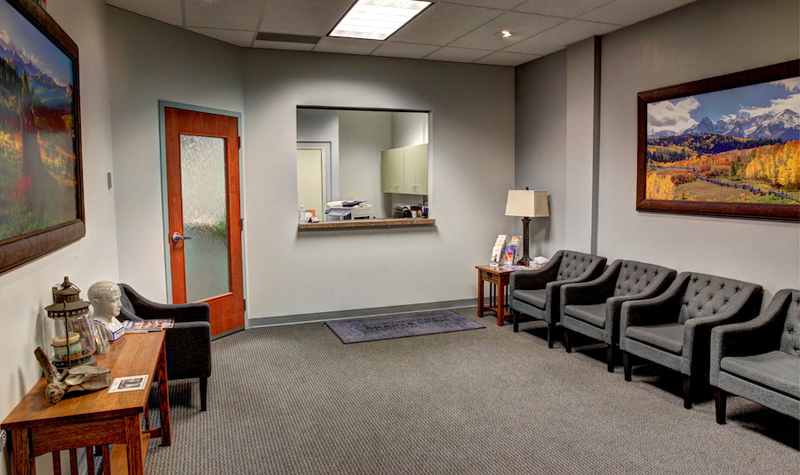 Both the initial surgery and battery replacement surgery is often outpatient. The VNS works in two main ways. The stimulator automatically sends an electric pulse roughly every 5 minutes to prevent a seizure from forming. However if a seizure still starts, the patient or a family member can place a magnet over the battery to send an extra electric pulse. Newer versions of the VNS can also sense a dramatic increased heart rate associated with seizures which also can instigate an electric pulse. The most common side effects of VNS surgery are side effects of the stimulation. The vagus nerve has many functions in the body and connects to the brain, heart, voice box and belly organs, to name a few. Some patients may feel an abnormal feeling in their stomach. Some may slightly feel the stimulation sensation in the neck. Some may note a slight change in their voice if they are speaking when the device sends its electric pulse, or experience throat pain or coughing. Rarely, patients may develop an abnormal heartbeat. Usually these side effects resolve with time or after changing the stimulation parameters of the device. Newer studies may show more seizure improvement over time. 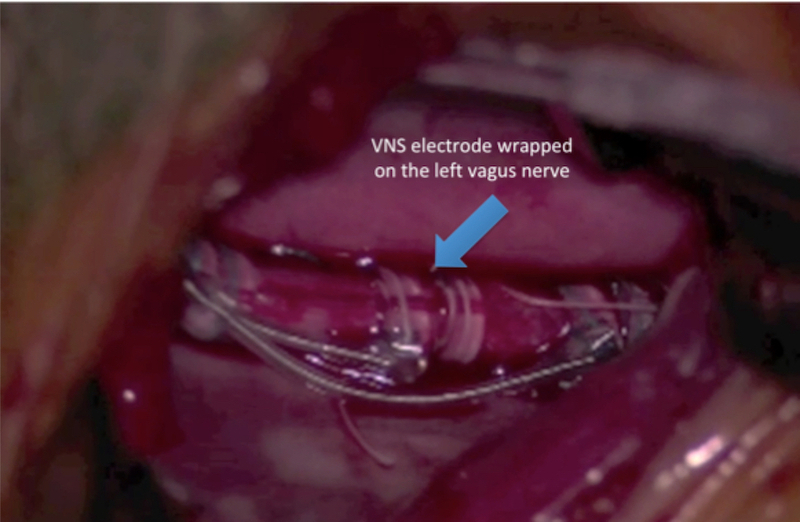 A VNS device is unlikely to completely stop seizures. The main goal is to diminish seizures and medication use. Historically, patients could expect about 20-30% improvement in seizures in the first 3-6 months, which could increase up to 40-50% improvement after a few years. Newer studies may show more seizure improvement over time. There may be up to 75% reduction is seizure frequency at 10 years. Unfortunately, there is no way to predict a success rate prior to surgery. It should also be noted what we mean by seizure improvement. Epilepsy outcome is often classified on a scale. Engel class I outcome is often thought to be complete seizure freedom or rare non-disabling seizures. Engel class II outcome is often thought to be >90% seizure frequency reduction. Engel class III outcome is ~50-90% reduction. Engel class IV is less than 50% reduction. Engel class V is no reduction. Engel class I is rarely achieved. A VNS device is compatible with brain MRIs, however recipients cannot undergo body MRIs following the procedure. If you have questions about epilepsy surgery, contact our BOARD CERTIFIED surgeon at Rocky Mountain Brain & Spine Institute.